Containers First Water Tanks are built for rapid water delivery in dust suppression tankers on building sites, allowing fast on demand filling of tankers as required. The tank is 26,000 litres and used for on-site water storage and delivery. Lay-flat hose to allow flow into water tanker trucks on site. Twist-locks to ensue both units lock into each other. 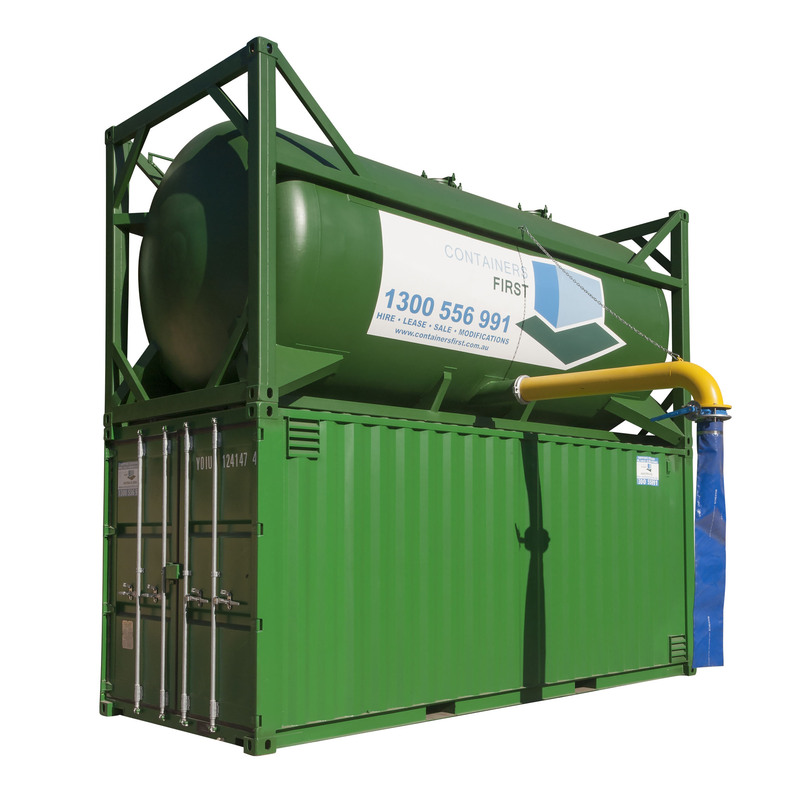 Water Tanks – Instead of waiting many hours to fill the 8,000-10,000 litre water cart from the water main, the clever design of the Containers First Water Filling Station can provide rapid delivery of multiple loads in 8-10 minutes for each water cart, allowing for minimal downtime. The water carts simply drive underneath, release the valve and shortly thereafter are delivering water where it is required. The storage tank can be filling whenever the tank is not full. The key to the water delivery system is the 8-inch pipe extending 2 metres from the side of the tank. 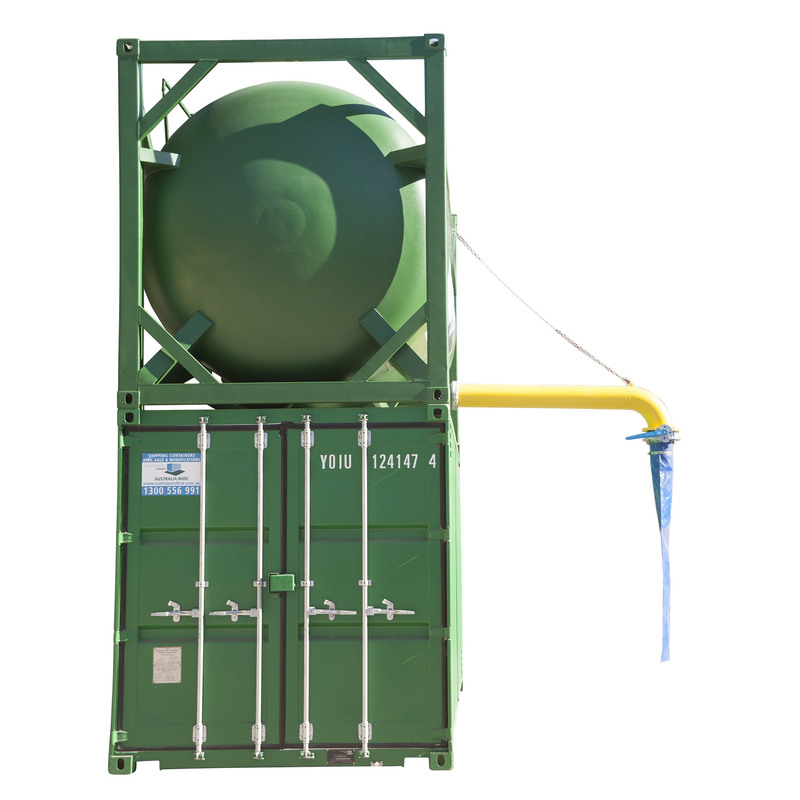 The pipe is removable for transport via standard ISO shipping methods and then secured by a locking mechanism and a secondary chain that attaches from the tank to the pipe, which comprises a well-engineered solution for maximum protection and safety. The System comprises 2 parts. The first being the water tank and the second being a 20ft shipping container that is used to raise the tank for top filling of tankers. The container below not only raises the Tank but also serves as an on-site storage unit and a workshop. The solid steel construction of the shipping container gives extra protection to the tools and equipment stored within. The large double doors allow for large and bulky items to be placed inside the container via forklift if required for safe storage or easy access in the workshop. The base shipping container is capable of having multiple tanks stacked on top and beside the system for increased capacity. Float automation allows for the main water supply to fill the Containers First Water Filling Station continuously when not in use. When it reaches the safe fill level it then stops the mains flow automatically. Managing the amount of water during delivery and controls for filling of different sized containers is an option that is easily added if required.